Sernsi Drelas is a Dunmer pawnbroker who will take up residence at Rethan Manor after you have built your stronghold. 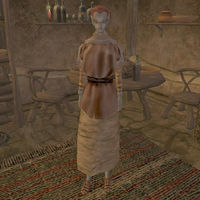 If you are a fellow member of House Hlaalu, she will have a selection of items for you to purchase. If you are a member of House Redoran or House Telvanni, on the other hand, she will likely attack you.